(4.2/5)Petmate Le Bistro gravity feeder allows you to free feed your pet without having to refill the food bowl constantly. 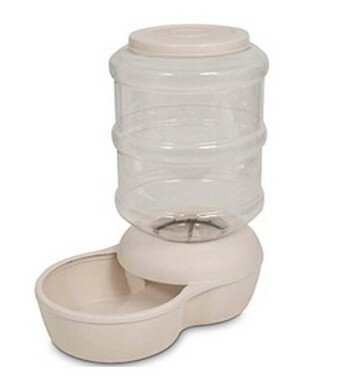 This gravity feeder is suitable for a single or multiple pets and it has a good capacity of 18 lbs of dry food. This 18 lb capacity allows you to feed your pet while you are away on short trips. The base and lid are dishwasher safe, the bottle is not. It features recessed handle areas for easy lifting and carrying. Petmate Le Bistro gravity feeder has been designed with a high polish and it features a smooth surface. The unit is environmentally friendly. Bottles are made of PET plastic, healthier for your cat and more environmentally friendly than PVC plastic. 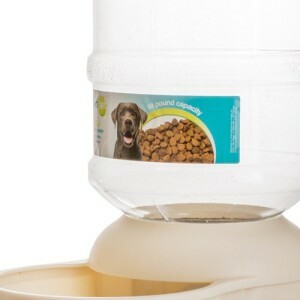 Gravity system keeps you from refilling the food bowl constantly. The food does not flow down into the bowl, it needs a shaking once in while for the food to fall. It’s not easy to hand wash the base, it has some hard to reach nooks and crannies. If you don’t want the food to get stuck in the throat of the bottle you can raise the back of the feeder about 1 ½ inches. This way the food will keep falling into the food tray easier. To clean the bottle simply get a bottle brush at Walmart, they are cheap ($3.00). This way you can reach all the inside without a problem. If your cat is a little messy when eating, you may have to clean the bowl every 2 or 3 days. Petmate Le Bistro gravity feeder offers a good value for money and it works fine if using small kibble and shaking the unit once in a while or raising the back of the feeder a little bit to ensure the food will keep falling into the tray. 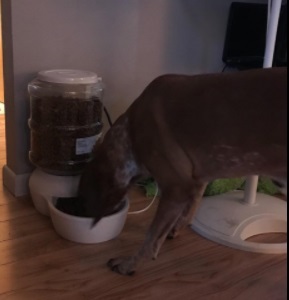 If your pet is smart enough to push the food with its paws to get kibble to fall into the bowl, then the feeder will work pretty well. The unit is larger than how it looks in pictures. The Petmate Le Bistro gravity feeder has a very good capacity that makes this unit a good solution for multi-cat households. As this feeder will possibly need a little shake here and there or have the back raised to keep the food falling into the tray this may not be the feeder for you if you don’t want to supervise the feeder at all, but if you don’t mind shaking the feeder every 3 days or so (with one cat) or lifting the unit a little bit, you will find a good value for money with this unit. If you have a single cat this the Petmate Gravity Feeder might be a little too big for it, but it’s suitable if you want to feed 2 or more cats.